I'm surprised that Insight Editions' the publisher for this book. Looks like they are venturing into comic artbooks. 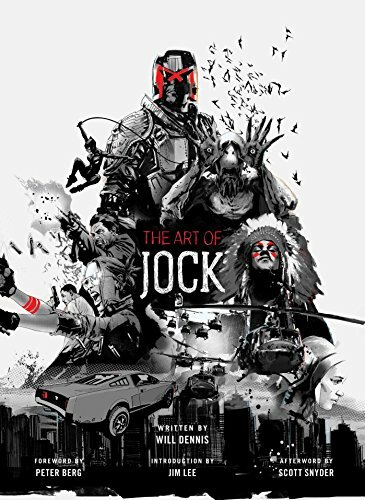 The Art of Jock is given the large hardcover coffee table book treatment. There are 160 pages and there's even an author, Will Dennis, assigned. In addition to all that, there are also the beautiful posters created for the popular pop culture company Mondo. I love Mondo's posters and Jock's interpretation for the selected movies. There are Shaun of the Dead, The Thing, Pan's Labyrinth, Cannibal Holocaust and more. He has also created concept art for films such as Dredd, Ex Machina, Battleship. I read that he has contributed art for Star Wars Episode VIII but those were not included. Highly recommend to fans of Jock and comic art.